The sun produces UV radiation. Too much exposure can cause a form of radiation burn that we all know as a sunburn. I’m sure you’re familiar with the red skin, blisters, peeling, pain, even fatigue and dizziness that can come along with sunburns. It’s no fun at all! After the UV exposure, skin may turn red in as little as 30 minutes but it most often takes around 2 to 6 hours for the visible burn to develop. Pain is usually most severe between 6 and 48 hours after the initial exposure. The burn continues to develop for 24 to 72 hours, occasionally followed by peeling skin in 3 to 8 days. In some cases, peeling and itching may continue for several weeks. 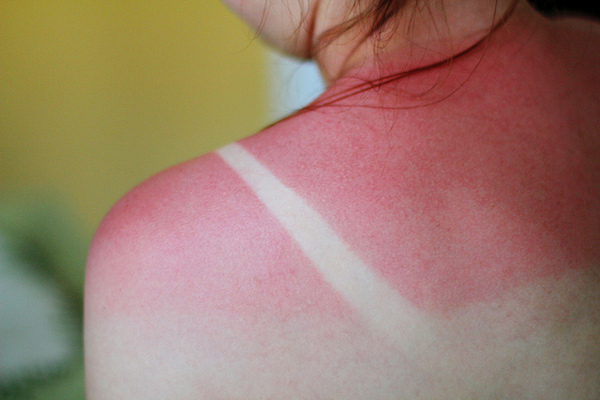 Severe sunburns can even require hospitalization! The cause of sunburn is the direct damage that a UV-B photon can induce in DNA. When the skin cells’ DNA is damaged by UV radiation, Type I cell-death is triggered and the skin is replaced. Malignant melanoma may occur as a result of indirect DNA damage if the damage is not properly repaired. Excessive UV radiation is the leading cause of primarily non-malignant skin tumors. To avoid sunburn, limit your exposure to the sun. Simple enough, right? Tanning beds also produce UV rays, so they should also be avoided in order to reduce your risks of skin damage. When you’re outside, wearing hats and clothes that cover your skin will help shield you from the sun. Sunscreen applied to exposed skin also helps reduce your risk of burning. If you do happen to burn, there’s no “cure” but there are things you can do to help alleviate the symptoms until the burn heals. Use cool, wet clothes or take cool showers to help bring your body temperature down. Apply soothing lotions that contain aloe vera to sunburned areas to soothe the skin. Topical steroids (such as 1% hydrocortisone cream) may also help with pain and swelling. Note: Do not use the cream on children younger than age 2 unless your doctor tells you to. Oatmeal and chamomile are sometimes recommended to help with the itching and peeling. But what about tanning? You want that sun-kissed color, but you don’t want to put yourself at risk! What are you supposed to do?! Well, that’s where airbrush tanning comes in. You can get the color without the sun! It’s not a stain, you won’t turn orange – it’s a natural, organic compound that produces color in the top layer of your skin but doesn’t damage the deeper layers the way UV rays from the sun or tanning beds can!